It is the second line above which caught my attention, but it is placed in perspective by the lines immediately preceding and following it. The third line speaks about our Lord’s birth at Bethlehem, so the second line is probably referring to the days of Mary’s pregnancy and perhaps the period of time as she made her way there. She carried her unborn baby Jesus “along forgotten roads” as all expectant mothers do. In her case, we think of the road from Nazareth to the hill country of Judea – probably to the town of Ain-Karim – where her cousin Elizabeth lived with her husband the priest Zechariah. This town is near Jerusalem so Mary would have probably gone to Jerusalem a number of times during her three month visit. Then she returned to Nazareth and spent another four or five months there. But occasionally she would be out on the nearby roads to visit someone or obtain some item. 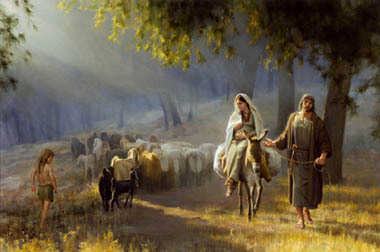 Finally there is the journey to Bethlehem when Mary is perhaps in her eighth month of pregnancy. God Incarnate and unborn left His mark on the roads of Israel, vicariously through the footsteps of Mary as she did the Will of God. Later John the Baptist would “make straight in the desert a highway for our God” (Isa 40:3), preparing the way of the Lord. But, in her own way Mary tried to make His way comfortable and safe, bearing Him with love and devotion even before the day of His birth. “How beautiful upon the mountains are the feet of (her) who brings good news” (Isa 52:7). For Mary, for all pregnant women – and for all unborn babies – all these roads lead to Bethlehem.